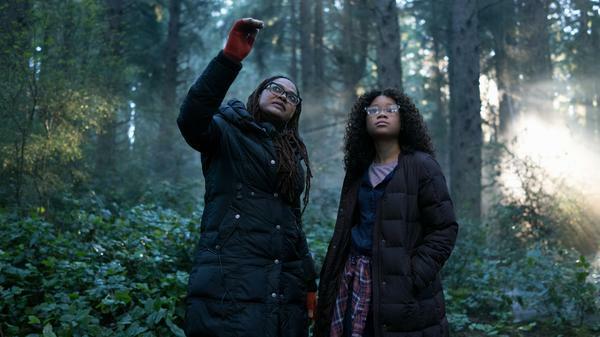 With A Wrinkle In Time, Ava DuVernay — seen here instructing Storm Reid on set — became the first African-American woman to direct a movie with a budget exceeding $100 million. Atsushi Nishijima / Disney Enterprises, Inc.
L-R: Mindy Kaling is Mrs. Who, Oprah Winfrey is Mrs. Which and Reese Witherspoon is Mrs. Whatsit in Disney's A Wrinkle In Time. 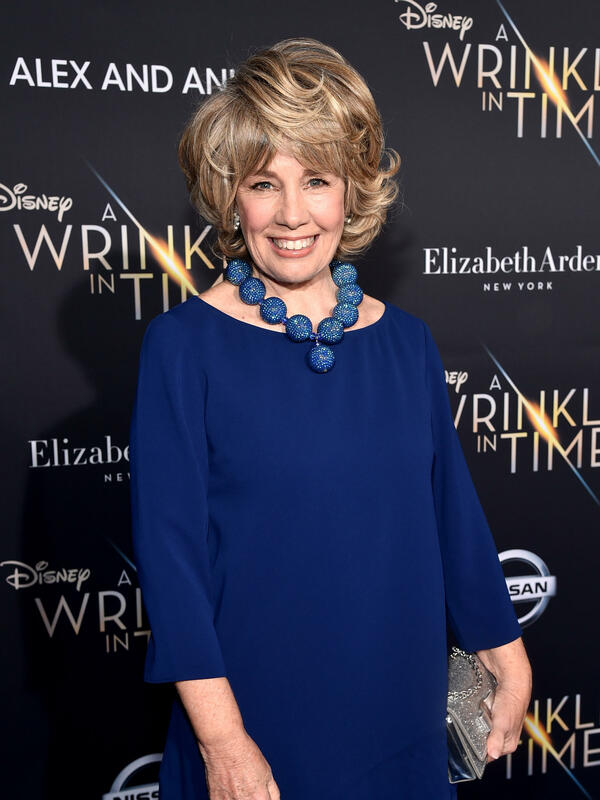 Producer Catherine Hand, who had dreamed of making the movie version of A Wrinkle In Time for over a half-century, was on hand for the world premiere of Disney's new film. A Wrinkle In Time follows Meg Murry (Storm Reid), her little brother Charles Wallace Murry (Deric McCabe) and her best friend Calvin O'Keefe (Levi Miller) in their adventures through space and time. She was shooting the climactic action sequence of the science fantasy movie. Actors Storm Reid and Chris Pine ran though a complicated set that would later be digitally rendered to represent a tesseract — a portal through space and time, by way of a fifth dimension. When DuVernay became the first African-American woman to direct a movie with a budget over $100 million, it was her job to help create new worlds. That included hiring a diverse cast and crew. "I'm proud of what this crew looks like," DuVernay says. "It looks like the real world. Different kinds of people, colors, creeds, cultures of people. I cast it with what came to my mind, what came to my imagination, what came to my heart." DuVernay imagined the hero of the story — Meg Murry — as a biracial teen with curly hair and glasses. She leaves her home (filmed in Compton, Calif., DuVernay's hometown) and travels through time and space looking for her father, a scientist who has mysteriously disappeared. "Meg is a lost teenager, as in trying to find herself," Reid says. "And she's just getting in a lot of trouble. She is worried about her dad, and her dad's been missing for the past four years, and not knowing if her dad really did get lost in the universe or if her dad left her." In her search, Meg goes on an interplanetary adventure with her precocious little brother Charles Wallace Murry (Deric McCabe) and her best friend Calvin O'Keefe (Levi Miller). They're guided by three mysterious celestial beings — Mrs. Whatsit, Mrs. Who, and Mrs. Which — played by Reese Witherspoon, Mindy Kaling and Oprah Winfrey, respectively. It's Mrs. Which who tells Meg that she's the only one who can save her father from an evil in the universe. "Be a warrior," she urges. To get to the origin of this film, you have to wrinkle time back to the early 1960s, when Madeleine L'Engle finished a young adult novel inspired by quantum physics. It opens with the familiar line: "It was a dark and stormy night." She was rejected by dozens of publishers who said the themes were too complicated for kids. But Farrar, Straus and Giroux took a chance, publishing A Wrinkle In Time in 1962. The following year, the sci-fi book with a female hero won a prestigious Newbery Award for children's literature. And it caught the imagination of a Los Angeles fifth grader named Catherine Hand. She says she'd been sent to her school library for talking too much in class. "And this librarian comes over to me and says, 'I have a book I think that you would like,'" Hand says. "'It's about a little girl just like you.'" That night, she sat down with the book. The Santa Ana winds were blowing through the open window of her bedroom. "It was a dark and stormy night," Hand says. "And I read the book. I loved it. And I started a letter to Walt Disney to tell him about this book and have me star as Meg. And I was a little shy in sending him the letter, so I kind of put it to the side." Walt Disney died a year later. "And I knew of nobody who made movies for children other than Walt Disney," Hand says. "So I made a promise to myself that I would grow up and make the movie." Fast forward through time and space to 1979: Catherine Hand is in her 20s and is an executive assistant to writer-producer Norman Lear — creator of hit 1970s TV shows such as All In The Family and The Jeffersons. Hand says she convinced him to ask for the movie rights to her favorite book. Then she met up with Madeleine L'Engle at the restaurant on top of the World Trade Center. "I was so nervous," Hand says. "I mean, to me, she had been the goddess in my life. She had painted the picture of the universe that was so real to me. And we're sitting at lunch and she leans over and she says, 'You know, there really is such a thing as a tesseract.' And I thought: Oh my god! I'm sitting here with Mrs. Whatsit!" L'Engle gave her blessing — and the movie rights — to Lear's company. But Lear's first choice as director, Stanley Kubrick, passed on the project. "And I went through many, many different writers, many different screenplays. I worked on it for about 10 years with Norman. And then his option was up. And by that time, I had become extremely close to Madeleine. And so basically she said, 'Well, OK, you go set it up someplace else, and I won't sign anything unless you're the producer.'" Hand went on to become vice president of Embassy Pictures and development director for Francis Ford Coppola's American Zoetrope production company. She also worked in politics, helping launch the liberal advocacy group People for the American Way. And for decades, she continued to pursue A Wrinkle In Time as a movie. Finally, in 2003, Hand executive-produced a made-for-TV version by Miramax and ABC Films. But Hand says she and L'Engle, who died in 2007, felt the final product fell flat. "She was disappointed with that and so was I," she says. "We had so many constraints. And number one was budget. At the end of the day, you take a look at it and go: Wait a minute, was that my childhood dream? No it's not. So it took another 14 years to get here." So 54 years after she first read the book, Hand is now one of the producers for Disney's new $100 million dollar film. "It's a very emotional story," she says. "It's about growing up. You know, what is good, what is evil, what is family, what is love — amidst a cosmic backdrop of a grand adventure. I used to say it was it was a cross between The Wizard Of Oz and Star Wars." Back on set, director Ava DuVernay says L'Engle had a lot to say about society. "You know, the battle of light and dark, the moral battles that are happening with the characters in the film, certainly figure into what folks might be thinking about right now — politically, culturally, economically," she says. "It existed for the author at the time that she wrote it ... and certainly we haven't combatted those issues now. So this material still resonates today." Over the years, some people have objected to the book's themes. A Wrinkle In Time remains one of the most frequently banned American books. "That's why this book is awesome," DuVernay says. "It was a banned book. That's my favorite thing about this project. It's like on the top 10 banned book list, and that just makes me say: Yes! Let's do it." DuVernay says this is the right moment to tell a story about fighting darkness with light. I have this distant memory of one of the places where I read "A Wrinkle In Time." It was an elementary school desk toward the left side of the classroom, I think near the window. Of course, the action in the novel happened in no particular place. The characters travel across time and space, an adventure entirely in the mind. So how do you choose real-world places to shoot the scenes of "A Wrinkle In Time" for a movie? The cast and crew of the upcoming film traveled to the mountains of New Zealand and a sequoia forest in Northern California and made elaborate sets on a sound stage in Santa Clarita, north of Los Angeles, which is where NPR's Mandalit del Barco went to see the filming. MANDALIT DEL BARCO, BYLINE: Director Ava DuVernay stands behind the camera for an action sequence leading up to the climax of the sci-fi fantasy movie. AVA DUVERNAY: Ready. And action. DEL BARCO: The actors run through a complicated production set meant to be a passageway to a dark place in the universe. They use something called a tesseract, which allows for travel through time and space. When DuVernay became the first African-American woman to direct a movie with a budget more than $100 million, it was her job to help create new worlds. That included hiring a diverse cast and crew. DUVERNAY: We're standing here on the set of "A Wrinkle In Time." And as I look out talking to you, I'm proud of what this crew looks like. It looks like the real world, different kinds of people - colors, creeds, cultures of people. I cast with what came to my imagination, what came to my heart. OPRAH WINFREY: (As Mrs. Whatsit) Close your eyes. See with mine. DEL BARCO: DuVernay imagined the hero of the story, Meg Murry, as a biracial teen with curly hair and glasses. Meg leaves her home, which was filmed in DuVernay's hometown, Compton, to travel across dimensions and planets in search of her scientist father who has mysteriously disappeared. STORM REID: (As Meg Murry) He believes that we can travel the universe instantaneously. LEVI MILLER: (As Calvin O'Keefe) So you fold space? REID: (As Meg Murry) More like you wrinkle it. DEL BARCO: Meg is played by 14-year-old Storm Reid, who made her debut in the Oscar-winning film "12 Years A Slave." On set, she explains her character in this story. REID: Meg is a lost teenager trying to find herself. And she's just getting in a lot of trouble. She is worried about her dad, not knowing if her dad really did get lost in the universe or left her. DEL BARCO: Meg's father is portrayed by Chris Pine, the blue-eyed, blonde actor who played "Star Trek's" Captain Kirk and Wonder Woman's boyfriend. In her search, Meg goes on an interplanetary adventure with her precocious little brother and her friend. They're guided by three mysterious celestial beings - Mrs. Whatsit, Mrs. Who and Mrs. Which, played by Reese Witherspoon, Mindy Kaling and Oprah Winfrey. WINFREY: (As Mrs. Which) Be a warrior. DEL BARCO: To get to the origin of this film, you have to wrinkle time back to the 1960s. It was a dark and stormy night, Madeleine L'Engle wrote in the first line to her novel "A Wrinkle in Time." She was rejected by dozens of publishers who said the themes were too complicated for kids. But Farrar, Straus and Giroux took a chance publishing the sci-fi book with a rare young female hero. The book won a prestigious Newbery Award for children's literature. And it caught the imagination of a Los Angeles fifth-grader named Catherine Hand. She says she'd been sent to her school library for talking too much in class. CATHERINE HAND: And this librarian comes over to me and says, I have a book I think that you would like. It's about a little girl just like you. DEL BARCO: Hand says that night, she sat down with the book. The Santa Ana winds were blowing through the open window of her bedroom. HAND: It was a dark and stormy night. And I read the book. I loved it. And I started a letter to Walt Disney to tell him about this book and have me star as Meg. And I was a little shy in sending him the letter. So I kind of put it to the side. And then about a year later, he died. And I knew of nobody who made movies for children other than Walt Disney. So I made a promise to myself that I would grow up and make the movie. DEL BARCO: Fast-forward through time and space to 1979. Catherine Hand is now in her 20s and is an executive assistant to writer-producer Norman Lear, creator of hit TV shows such as "All In The Family" and "The Jeffersons." Hand says she convinced him to ask for the movie rights to her favorite book. So she meets up with Madeleine L'Engle at the restaurant on top of the World Trade Center. HAND: I was so nervous. She had been the goddess in my life. She had, like, painted the picture of the universe that was so real to me. And we're sitting at lunch. And she leans over and she says, you know, there really is such a thing as a tesseract. DEL BARCO: L'Engle gave her blessing and the movie rights to Lear's company, whose first choice as director, Stanley Kubrick, passed on the project. HAND: And I went through many, many different writers, many different screenplays. I worked on it for about 10 years with Norman. And then his option was up. By that time, I had become extremely close to Madeleine. So basically, she said - OK, well, you go set it up someplace else. And, you know, I won't sign anything unless you're the producer. DEL BARCO: Hand went on to become vice president of Embassy Pictures and development director for Francis Ford Coppola's American Zoetrope. She also worked in politics, helping launch the liberal advocacy group People For the American Way. And for decades, she continued to pursue "A Wrinkle In Time" as a movie. Finally, in 2003, Hand executive produced a made-for-TV version by Miramax and ABC Films. It featured Alfre Woodard as Mrs. Whatsit. ALFRE WOODARD: (As Mrs. Whatsit) The last step of any journey may be the first step of an even greater adventure. DEL BARCO: But Hand says she and L'Engle, who died in 2007, felt that movie fell flat. HAND: She was disappointed with that, and so was I. We had so many constraints, and the No. 1 was budget. DEL BARCO: Fifty-four years after she first read the book, Hand is now one of the producers for Disney's new $100 million film. HAND: It's a very emotional story. It's about what is good, what is evil, what is family, what is love - amidst a cosmic backdrop of a grand adventure. You know, I used to say it was a cross between "The Wizard Of Oz" and "Star Wars." DEL BARCO: Back on set, director Ava DuVernay agrees that L'Engle had a lot to say about society. DUVERNAY: You know, the battle of light and dark. The moral battles that are happening with the characters in the film certainly figure into what folks might be thinking about right now politically, culturally, economically. It existed for the author at the time that she wrote it. And certainly, we haven't combated those issues now. So this material still resonates today. DEL BARCO: Over the years, some people have objected to the book's themes. "A Wrinkle In Time" remains one of the most frequently banned American books. DUVERNAY: This book is awesome. It was a banned book. That's my favorite thing. It's like on the top 10 banned book list. And that just makes me say, yes - let's do it. DEL BARCO: DuVernay says this is the right moment to tell a story about fighting darkness with light. Mandalit del Barco, NPR News. SADE: (Singing) They come to see the fire burning... Transcript provided by NPR, Copyright NPR.